29. Ghedotti, M.J., Gruber, J.N., Barton, R.W., Davis, M.P., and Smith, W.L. (2018). Morphology and evolution of bioluminescent organs in the glowbellies (Percomorpha: Acropomatidae) with comments on the taxonomy and phylogeny of Acropomatiformes. Journal of Morphology. 28. Smith, W.L., Buck C.A., Ornay G.S., Davis M.P., Martin R.P., Gibson S.Z., and Girard M.G. (2018). Improving Vertebrate Skeleton Images: Fluorescence and the Non-Permanent Mounting of Cleared-and-Stained Specimens. Copeia 106(3):427-435. Becker, R. The Verge. "How scientists captured a stunning, hellish menagerie of half-dissolved creatures." Starr, M. Science Alert. "These Hauntingly Beautiful Images Reveal an Unseen World Beneath Vertebrates' Skin." Stang, C. St. Cloud State Today. "Biologists monsters are works of art." 27. Martin, R.P., Olson, E.E., Girard, M.G., Smith, W.L., and Davis, M.P. (2018). Light in the Darkness: New Perspective on Lanternfish Relationships and Classification Using Genomic and Morphological Data. Molecular Phylogenetics & Evolution. 26. Ghedotti, M.J., and Davis, M.P. (2018, In Press). Poeciliidae: Livebearers. In: Warren, M.L. Jr. and Burr, B.M. (Eds. ), North American Freshwater Fishes: Natural History, Ecology, and Conservation Volume II. 25. Ghedotti, M.J., and Davis, M.P. (2017). The taxonomic placement of three fossil Fundulus species and the timing of divergence within the North American topminnows (Teleostei: Fundulidae). Zootaxa. 4250 (6): 577–586. 24. Martin, R.P., and Davis, M.P. (2016). Patterns of Phenotypic Variation in the Mouth Size of Lanternfishes (Teleostei: Myctophiformes). Copeia. 104(4):795-807. Blaszczak-Boxe, A. Live Science. "Fish Venom Unveiled: Toxins Evolved Many Times, Study Shows." Lynch, B. EurekAlert! "Researchers tally huge number of venomous fishes, tout potential for medical therapies." de Lazaro, E. Sci News. "Study Finds Venom Has Evolved 18 Times in Marine and Freshwater Fishes." Hays, B. UPI. "Study: Venomous fish could be repository of medicinal compounds." 22. Davis, M.P., Sparks, J.S., and Smith, W.L. (2016). Repeated and Widespread Evolution of Bioluminescence in Marine Fishes. PLOS ONE. 11(6): e0155154. Douglass, M. BBC Earth. "The Ocean is a Strange Place at Night." Yong, E. National Geographic. "Surprising History of Glowing Fish." Netburn, D. LA Times. "Bioluminescence is so useful to fish that it evolved 27 times, study says." Frazer, J. Scientific American. "Eighty Percent of Open Ocean Fish Make Light." Ash, C. Science (22 Jul 2016: Vol. 353, Issue 6297, pp. 360). "How fish evolved an abyssal glow." Harvey, C. Mashable. "There are Far More Glowing Fish in the Sea Than Previously Known." Nuwer, R. Smithsonian Magazine. "Way More Fish Can Make Their Own Light Than We Thought." Newitz, A. Ars Technica. "Evolution favors the bioluminescent." Bates, M. PLOS Ecology Community. "The Oceans are Aglow With Light-Up Fishes." Feltman, R. The Washington Post. "Glow-in-the-Dark Fish Have Evolved Over and Over Again." Kuhr, M. Newsweek. "Bioluminescence is Spreading to New Fish Species." Lewis, T. The Scientist. "Evolution of Fish Bioluminescence." Sierra, C. Pulse Headlines. "Glowing deep ocean fishes have evolved at least 27 times." Navarro, A. Tech Times. "Glow-in-the-dark Ocean Fish Are More Widespread Than Known." PLOS. EurekAlert! "New research shines light on evolutionary variety of bioluminescent ocean fishes." AMNH. News and Blogs. "Bioluminescence Evolved Frequently in Fish." Scalise, J. Science Recorder. "Bioluminescence More Common than Previously Believed." Best, S. Daily Mail. "Glow-in-the-dark fish are more common than thought: Bioluminescence is so useful in oceans it evolved 27 times." Davis, J. IFLScience!. "Bioluminescence In Fish Is Far More Widespread Than Previously Thought." Howard, B.C. National Geographic. "Through a Shark's Eyes: See How They Glow in the Deep." Preston, E. The Atlantic. "Scientists Have Developed Shark Vision." Frazer, J. Scientific American. "Cat Sharks Send Secret, Fluorescent Messages." Ossola, A. Popular Science. "Sharks Glow, But Only For Each Other." Snyder, K. EurekAlert!. "Patterns of Glowing Sharks Get Clearer with Depth." Feltman, R. The Washington Post. "Scientists Built a Special Camera to Study Glow-In-The-Dark Sharks." 20. Davis, M.P. (2015). Evolutionary Relationships of the Deep-Sea Pearleyes (Aulopiformes: Scopelarchidae) and a New Genus of Pearleye from Antarctic Waters. Copeia. 103(1):64-71. 18. Davis, M.P., Holcroft, N.I., Wiley, E.O., Sparks, J.S., and Smith, W.L. (2014). Species-Specific Bioluminescence Facilitates Speciation in the Deep Sea. Marine Biology. DOI: 10.1007/s00227-014-2406-x. Foley, J.A. Nature World News. "Bioluminescence in Deep-Sea Fishes Breeds Species Diversity." Synder, K. American Museum of Natural History. "Bioluminescent Fish Flashing Patterns Might Facilitate Mating." Lynch, B. KU News. "Research will shed light upon the family tree of deep-sea fishes." 17. Sparks, J.S., Schelly, R.C., Smith, W.L., Davis, M.P., Tchernov, D., Pieribone, V., and Gruber, D.F. (2014). The Covert World of Fish Biofluorescence: A Phylogenetically Widespread and Phenotypically Variable Phenomenon. PLOS ONE. 9(1): e83259. Gorman, J. New York Times. "Fluorescence Is Widespread in Fish, Study Finds." Netburn, D. LA Times. "Undersea light show: The secret neon world of biofluorescent fish." Conciatore, J. National Science Foundation (Biological Sciences Discovery). "Fish aglow: Hidden colors in the sea"
Venton, D. Nature News. "Fish flaunt neon glow." Randall, I. Science Now. "Fish Put on a Light Show." Lee, J. National Geographic. "Fish Light Up in Neon Colors." Almasy, S. CNN. "From blue to green, red or orange: Fish put on new light." Mason, B. Wired. "Scientists Discover 180 Species of Glowing Fish." Thomas, P. Slate. "Diving Deep with the Ocean's Biofluorescent Fish." Marash, C. World Science Festival. "Fluorescent Fish Light Up the Deep Blue Sea." Misra, R. IO9. "These new species of biofluorescent fish are beautifully strange." Tu, C. Science Friday. "Picture of the Week: Biofluorescing Fish." Poppick, L. LiveScience. "Glow Fish: Drab Species Secretly Don Bright Colors." Snyder, K. American Museum of Natural History. "Researchers Reveal Covert World of Fish Biofluorescence." 16. McMahan, C.D., Chakrabarty, P., Sparks, J.S., Smith, W.L., and Davis, M.P. (2013). Temporal Patterns of Diversification across Global Cichlid Biodiversity (Acanthomorpha: Cichlidae). PLoS ONE. 8(8): e71162. 15. Davis, M.P., Arratia, G.A., and Kaiser, T. (2013). The first fossil shellear and its implications for the evolution and divergence of the Kneriidae (Teleostei: Gonorynchiformes). In: Arratia, G.A., Schultze, H.P., and Wilson, M.V.H. (Eds. ), Mesozoic Fishes V. München (Verlag Dr. F. Pfeil). PP. 325-362. 14. Davis, M.P., Midford, P.E., and Maddison, W. (2013). Exploring power and parameter estimation of the BiSSE method for analyzing species diversification. BMC Evolutionary Biology. 13:38 DOI: 10.1186/1471-2148-13-38. Highly Accessed. 13. Ghedotti, M.J., and Davis, M.P. (2013). Phylogeny, classification, and evolution of salinity tolerance of the North American topminnows and killifishes, Family Fundulidae (Teleostei: Cyprinodontiformes). Fieldiana: Life and Earth Sciences. 7(2013):1-65. 12. McMahan, C.D., Davis, M.P., Dominguez-Dominguez, O., Garcia de Leon, F., Doadrio, I. and K.R. Piller. (2012). From the Mountains to the Sea: Phylogeography and Cryptic Species Diversity within the Mountain Mullet, Agonostomus monticola (Teleostei: Mugilidae). Journal of Biogeography. DOI: 10.1111/jbi.12036. 11. Chakrabarty, P., Davis, M.P., and Sparks, J.S. (2012). The first record of a trans-oceanic sister-group relationship between obligate vertebrate troglobites. PLoS ONE. 7(8): e44083. Ball, J. BBC News. "Goby fish 6,000km apart share eyeless common ancestor." 10. Near, T.J., Eytan, R.I., Dornburg, A., Kuhn, K.L., Moore, J.A., Davis, M.P., Wainwright, P.C., Friedman, M., and Smith, W.L. (2012). Resolution of ray-finned fish phylogeny and timing of diversification. Proceedings of the National Academy of Sciences. 109(34):13698-703. Real. N. FISHBIO: Fisheries research, monitoring, and conservation. "Ray-finned fishes get new family tree." 09. Chakrabarty, P., Davis, M.P., Smith, W.L., Berquist, R., Gledhill, K.M., Frank, L.R., and Sparks, J.S. (2011). 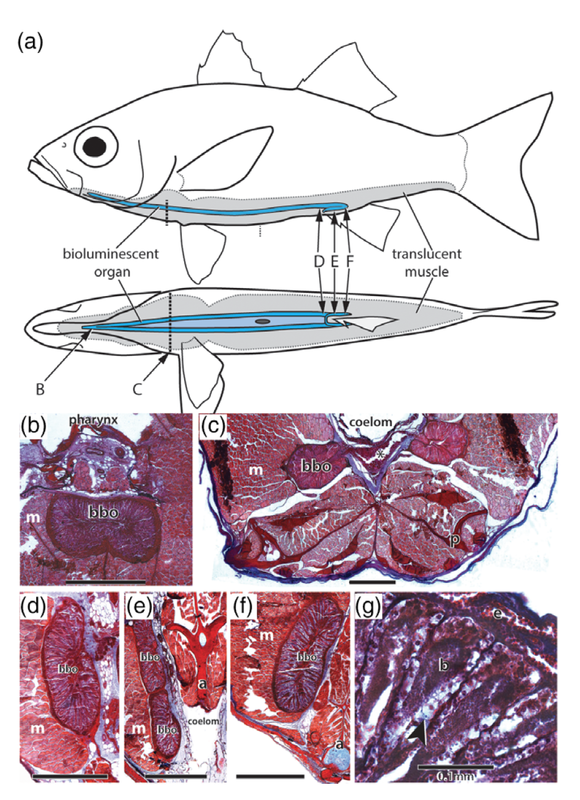 Evolution of the light organ system in ponyfishes (Teleostei: Leiognathidae). Journal of Morphology. (272) 6: 704-721. 08. Chakrabarty, P., Davis, M.P., Smith, W.L., Baldwin, Z., and Sparks, J.S. (2011). Is sexual selection driving diversification of the bioluminescent ponyfishes (Teleostei: Leiognathidae)? Molecular Ecology. (20) 13: 2818-2834. 07. Wiley, E.O., Chakrabarty, P., Craig, M.T., Davis, M.P., Holcroft, N.I., Mayden, R.L., and Smith, W.L. (2011). A Response to Mooi, Williams, and Gill. Zootaxa. 2946: 33-37. 06. Wiley, E.O., Chakrabarty, P., Craig, M.T., Davis, M.P., Holcroft, N.I., Mayden, R.L., and Smith, W.L. (2011). Will the real phylogeneticists please stand up? Zootaxa. 2946: 7-16. 05. Davis, M.P., and Chakrabarty, P. (2011). Tripodfish locomotion and landing behavior (Aulopiformes: Bathypterois) from video observations at bathypelagic depths in the campos basin of Brazil. Marine Biology Research, (7) 3:297-303. 04. Davis, M.P., and Fielitz, C. (2010). Estimating divergence times of lizardfishes and their allies (Euteleostei: Aulopiformes) and the timing of deep-sea adaptations. Molecular Phylogenetics and Evolution, (57) 3:1194-1208. 03. Davis, M.P., (2010). Evolutionary relationships of the Aulopiformes (Euteleostei: Cyclosquamata): a molecular and total evidence approach. In: Nelson, J. S., Schultze, H.-P., and Wilson, M. V. H. (Eds. ), Origin and phylogenetic interrelationships of teleosts. München (Verlag Dr. F. Pfeil). PP. 431-470. 02. Luttrell, G.R., F.R. Abe, M.P. Davis, and K.R. Anderson. (2007). Recent collections of the Slenderhead darter, Percina phoxocephala (Nelson), from the Kansas River Basin. Transactions of the Kansas Academy of Science 2007 (110):127-128. 01. Ghedotti, M.J., A.M. Simons, & M.P. Davis. (2004). Morphology and phylogeny of the studfish clade, subgenus Xenisma (Teleostei: Cyprinodontiformes). Copeia (1):53-61.